Healing traditions of indigenous people have always been a thorny subject—many of their methods do not conform to modern science, there is no standardisation, and recognition is a messy affair. In the last week of September, some 50 traditional healers gathered at a meet organised by C G Net Swara, a citizens’ journalism initiative, in Bhopal to deliberate these issues. But, most importantly, they celebrated the authenticity of their art and its continued relevance in modern times. They also formed an online network, Swasthya Swara. Its aim is to share the traditional healing knowledge and bring scientific recognition to their art. This is not an easy endeavour. Traditional healing is fraught with possibilities, says Surya Bali, head of the telemedicine department at the All India Institute of Medical Sciences, Bhopal. But it is difficult to make out what exactly is useful. A lot of people term healers’ activities like going into a trance or claiming to be possessed by deities as useless antics, but sometimes these are crucial for building trust between the healer and the community. On the other hand, the veracity of actual healing practices can be doubtful. 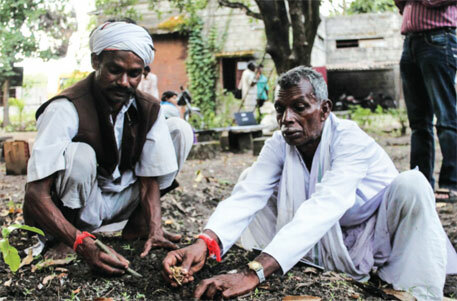 Bali, who is born to a traditional healer in Uttar Pradesh, recounts that his father used to prescribe the juice of a leaf growing nearby his house for treating jaundice. The remedy was known for its effectiveness in the area. “But as a medical student, I learnt that jaundice is a viral disease that heals on its own. Since then I have wondered if my father’s remedy was authentic.” Bali suggests that separating the wheat from the chaff by backing information with scientific evidence and systematic documentation will help the healers’ science get the recognition it deserves. But this is easier said than done. “Methods of traditional healing do not always conform to mainstream science,” points out A K Arun, homoeopath and public-health expert from Delhi who was present at the meet. A herb or a concoction can be effective in treating a particular disease in actual experience, but chemical examination of the constituents may not throw up corresponding results, explains Arun, also the chief editor of health journal, The Heritage. Traditional healers at the meet agree with Arun. “It is not easy to quantify the exact medical properties of a herb in the way satisfactory to conventional science,” says Anantram Shrimali, an elderly vaidya from Sagar, Madhya Pradesh. “Our science says properties of herbs change with the environment. A herb will have different healing properties depending on whether it grows on dry land or in a marsh, or the kind of vegetation it is surrounded with. Its effectiveness gets significantly impacted if it is cultivated rather than collected from the wild,” Shrimali says. So, standardisation along the lines of modern science may lead to confusion and loss of valuable knowledge, he cautions. Arun points out another disadvantage of trying to live up to scientific standards. It requires following protocols like clinical trials, which are expensive and beyond the reach of healers. Bali offers a solution: healing need not always be molecule-centric. Proper records and testimonies of patients who benefited from the treatment can also serve as scientific evidence, he says. Traditional healers agree with such general idea of scientific standardisation, but advise caution. “Our art by its very nature is highly individual and localised,” says Ashish Ratre, vaidya from Janjgir-Champa district in Chhattisgarh, who learnt the healer’s art while trying to cure herself of a skin disease. “There are different cures for the same disease, which may vary depending on local conditions, factors responsible for the disease and availability of herbs,” he informs. Whether Swasthya Swara will be able to achieve this balance is yet to be seen, but it is garnering interest from traditional healers as well as people. Shubhranshu Choudhuri, veteran journalist who heads C G Net Swara, says the idea behind Swasthya Swara is to make the information on traditional healing accessible to people, especially rural communities. “Despite government efforts to provide modern health care, a large section of the rural mass still trusts and depends on these healers for first-line health care,” he says. The network would help strengthen this tradition. The process for connecting with the network is simple. All it requires is a cellular phone, which is nearly ubiquitous in the country. One has to give a missed call on Swasthya Swara’s phone number—08602008111. Moderators of the network will then call back on the number and record the patient’s query. A traditional healer can share his remedy in a similar manner. The committee of moderators, which constitutes medical practitioners and traditional healers, ensures that if there is a remedy available for an ailment, the patient gets to know about it. Those who have access to the Internet can listen to the audio recordings by subscribing to Swasthya Swara’s website swasthya.swaranetwork.org/. All recordings are being stored online through an arrangement with Google. The forum thus serves as an informal documentation tool, informs Choudhuri. He claims that in one month, the network received 1,000 posts. A vaidya received 35 calls for a remedy he had posted. “We healers are rarely all-rounders. While one has the expertise in treating asthma, another can treat only digestive or rheumatic ailments. It is thus helping us learn from each other and expand our repertoire of skills,” says Jahaar Singh from Tikamgadh district of Madhy Pradesh, who has shared a series of remedies for reproductive problems on Swasthya Swara. “The forum will help boost the morale of healers,” says Harisingh Sihar from village Nanjora in Kondagaon district of Chhattisgarh. Choudhuri says the meet would be followed by networking activities to rope in more traditional healers. “We will upgrade the software based on the specific needs of this forum,” he says, adding that University of Washington has shown interest in providing technical support for upgradaion. This is very good work. I hope more people like you take interest in preserving and propagating our own accumulated knowledge to help people safely cure ailments without the need to ingest a thousand chemicals which cause more damage in other areas. My best wishes to you.